Click the button below to add the U-Marq GEM-FX4 Engraving Machine to your wish list. The UMARQ GEM-FX4 computerized engraving machine has raised the bar for engraving trophies, plaques, and awards. The UMARQ GEM-FX4 computerized engraving machine has the speed of the UMARQ GEM-RX4, but delivers an impressive 10.4” x 8” (265mm x 205mm) engraving area. Combined with UMARQ’s comprehensive and intuitive software, the UMARQ GEM-FX4 computerized engraving machine swiftly handles even the most intricate trophy, plaque, or award. The UMARQ GEM-FX4 computerized engraving machine is not just for trophies, plaques, and awards. Add the optional vise and standard jigs and jig pins, and the UMARQ GEM-FX4 computerized engraving machine will give you the flexibility of the UMARQ GEM-RX4 for gift and jewelry items. For the Jewelers, the UMARQ GEM-FX4 computerized engraving machine can be used with the optional precious metal cutter to create beautiful name or charm cut outs in precious metals, such as gold, silver, and copper. 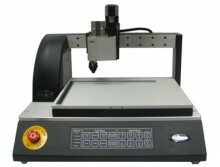 The UMARQ GEM-FX4 computerized engraving machine has fast become a favorite for the industrial sector. The UMARQ GEM-FX4 computerized engraving machine is compact, fast, and durable. The UMARQ GEM-FX4 computerized engraving machine is perfect for marking parts, engraving plates, labeling switch sockets, and creating identification tags. Whether you need to make one tag or hundred, the UMARQ GEM-FX4 computerized engraving machine combined with UMARQ’s robust and intuitive software handles every job with ease and precision. Want to offer your customers a unique option? Use the UMARQ GEM-FX4 computerized engraving machine with UMARQ’s optional photo engraving software to personalize that special gift or award with an engraved photograph. Add a photograph onto a lighter, plaque, trophy, or any other metal object with the UMARQ GEM-FX4 computerized engraving machine and UMARQ photo engraving software. It doesn’t matter whether you are a Jeweler, personalized gift retailer, in the industrial sector, or just looking for the next big thing, the UMARQ GEM-FX4 computerized engraving machine is a great addition to any business. The UMARQ GEM-FX4 computerized engraving machine, with its astounding speed, generous engraving area, compact size, and robust and intuitive software, will handle all of your engraving tasks with speed and precision. Cartridge spindle, lead screws and precision linear rails, steel chassis. Most materials are suitable for rotated or diamond drag, etc. USB to RS232 converter cable, power cable, serial cable, usb to serial converter, 120°diamond drag, carbide cutter, cutter knob, vernier nose cone, light touch, 100 fonts, UMARQ-GEM-FX4 engraving software package and quick start guide. 1 Ghz, Pentium 4, PC running windows 2000 or XP, 256mb ram, 100mb free disk space, 2 free usb ports, 256 color SVGA display, CD-ROM drive and mouse.